Window screens are a part of your windows that you may not think about until you need to use or replace them. Window screens can be made of many different materials, colours, and they can function completely differently depending on the type of window you have! Screens are vital for letting fresh air in your home while keeping everything else out. It’s important to make sure you’re getting the right screen for your particular use case; not only so it accomplishes what you want it to but so it also lasts a long time. Window screens can be made from many different materials, including fiberglass and aluminum. Fiberglass tends to be the standard today and will be the screen type you see most often. Screens will also come in many different sizes, and we don’t mean overall size but the size of the gaps in the screen material. Your screen mesh can vary depending on the strength and size; from really fine in size to keep out tiny insects like the no-see-um and sand flies, to a thicker, more durable mesh that is often used in more active areas like around the pool or a porch. If you have a pet that loves to hang out by your windows, or use your screens as scratching posts, you’ll want a pet specific material that will hold up to their daily abuse. 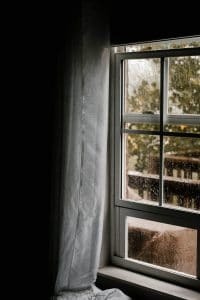 In our article discussing casement and double hung windows we wrote quite a bit about how those windows operate and how that changes the screen placement. 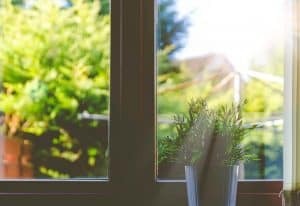 Screens are generally on the out side of the window and not in your home on a double hung, but due to the crank-out nature of a casement window the screen is located on the inside. There are many variations of windows, and sometimes the screen placement can be on the inside or outside, so you’ll want to speak with an expert before deciding. One way to ensure a long-lasting screen is to spend a little more money up front and keep your screens hidden except for when you’re using them. Retractable screens will stay hidden until you pull them down (or up) from their retractable home. Retractable screens have a few benefits, like keeping the window view clear when the window is closed. They also allow you to open the window and use as pass through if you’re on a patio. Screens that are hidden most of the time are also not subject to the harsh elements everyday like standard screens. Wind, rain, snow and the sun are all contributors to the premature replacement of your screen. One area that is often overlooked are screens that can help save you money. Solar screens can help reduce the amount of sunlight that hits your window, and thus reduce the amount of heat entering your home. Solar screens can often darken the view room or slight dampen the view as well, so you’ll want to make sure they’re the right choice for you. With windows being so efficient these days most people don’t use solar screens except in extreme cases. No matter what type of window you choose, talk to a professional about your screen options so you can make sure you’re getting the right screen for your home! What is the R-value of your Windows?